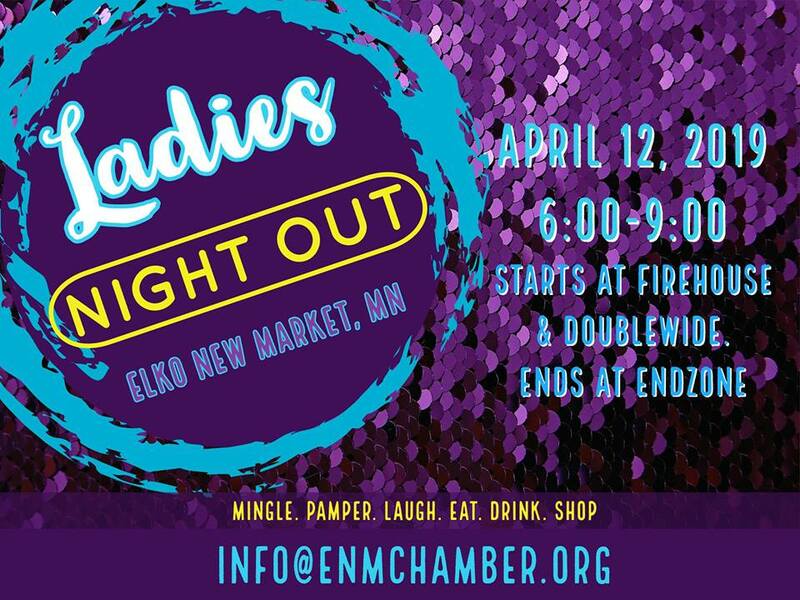 Friday, April 12 from 6-9 p.m.
Ladies’ Night Out is a great opportunity for women to enjoy a little “girl time,” shop and support Elko New Market businesses. The FREE, fun-filled evening offers ladies a chance to scout local products and meet business owners while enjoying free product samples, nibbling on tasty treats and winning prizes. Ladies check in for the evening at either the Firehouse Grille or the Doublewide and conclude at the EndZone at 9 p.m. with prize drawings. Schmitty & Sons/Grayline Tours will again provide a bus to shuttle women safely through town. No registration is necessary to partake in the fun! Businesses wishing to participate in the evening and/or sponsor the event, please register below. Businesses are invited to have an exhibitor table and sponsor the event for additional visibility leading up to and on the night of the event. You don’t need to have a physical location in New Market to participate. If you are located in New Market, please indicate how many other exhibitor tables you could host at your location. Host locations are strongly encouraged to be ENM Chamber members. As a sponsor, you can help ensure the Chamber shows the best possible hospitality to our guests and is able to offer great prizes at the end of the evening. Your business can reap the benefits of the added visibility that comes from being a sponsor. Deadline to register/sponsor: March 12, 2019. Note: Table fees contribute toward purchase of items for prize drawings at the end of the evening.